Yes, yes, fruits and vegetables are healthy. It is true they are chock full of vitamins, minerals and essential amino acids not found in proteins. We all know that they’re good for you; but are you familiar with how to choose your fruit and vegetables? Do you even know where they come from? Please don’t say ‘from a farm’ or ‘my bawab,’ because that would be very depressing. If you’re above the age of seven, you should already have a rudimentary knowledge of how to choose the best produce; a simple rule of thumb is ’if it smells like it should, then it’s fresh‘. So, a tomato should smell like a tomato, even through its thick skin. The next rule of thumb (we have two thumbs) is to trust your supplier; even if it’s a street-side stall. If you can’t trust the man, then you can’t trust the fruit that you’re buying. If you don’t have a regular produce-guy and you’re sick of relying on a hypermarket’s selection, then read on. Note: We’ve tried to provide phone numbers for as many venues as we could, but unfortunately, some of them do not have phone lines. Nasr City: A hallmark of Nasr City’s urban planning is the incorporation of ‘souks’ between almost every street and each one is anchored by a large produce vendor. One of the cleanest and most reliable souks is on the corner of Gad El Haq Street (which branches off Abu Dawood El Zahiri St.) and Abdallah Ibn Al Tahir St. Other recommendable souk options are on the corner of Gamal El Din Qassem and Fouad Badran; and also on Kabul Street. Heliopolis: Street stalls here are less ubiquitous than in Nasr City, but there are some excellent stalls that will take your order by telephone and deliver it to your house- provided you live in the vicinity. Otherwise, you can go pick it up yourself the next day. Opposite Cinema Heliopolis is Fakahany El Qalyoubeyya. Seasonal Fruits and meticulously cleaned vegetables are all arranged neatly in an air-conditioned interior. See something they don’t have? Give Sayed a call, and he’ll do his best to get it for you. On Ismailia Square is Ganet Fawakeh Ismailia (43, Othman Ibn Affan Street, Ismailia Square). In addition to being open quite late, this family-run business takes great pride in dealing with trustworthy sources, so the produce they sell is clean and free of impurities. Zamalek: While most residents opt for purchasing produce from large supermarkets, there are a few very good options available. Number 173 on 26th of July Street is simply called Fakahany. Offering a large variety of fruits, the store’s vegetable offering is nonexistent– hence the name. Seasonal vegetables are abound; just make sure you pick them yourself, and don’t get bullied into taking whatever he gives you. For some vegetable shopping, head over to Fakahany El Zamalek. They have an excellent variety of; most of them piled onto Styrofoam trays and wrapped in cling-film. Maadi: Probably the most spoilt of all areas; what Maadi lacks in quantity they sure make up for in quality. On Road Nine, between Massoud Supermarket and Maghrabi Optical, sits a well-loved Maadi favourite. This little gem is known for stocking some of the freshest and most exotic ingredients out there. Chives are always in supply, as are bean sprouts and other herbs, like tarragon and basil. The staff is also well-versed in the English names of the ingredients they stock, so don’t worry if the Arabic word for fennel escapes you– it’s fenochia by the way– speak up, and let him help you. TheVegbox.net: This is a vegetable store for the 21st century; you order via their website’s ’contact‘ page. 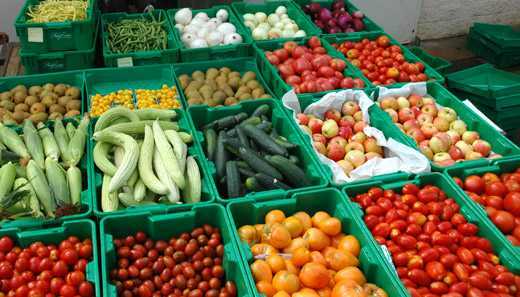 Their vegetable boxes come in three different sizes, each consists of differing weights of different vegetables, which are categorized into large or small veggies, herbs; and hard and soft fruits. There is also an option to order extra veggies not listed on their menu. They only deliver to Maadi and Katameya, and they’re in the process of opening a consumer outlet. Wadi Food: Wadi Food are better known for their organic olive oil; but they’ve extended their certified organic method to fresh produce, available at any of their four outlets around the Capital. If you’re the type of person that doesn’t mind paying a premium to get high-quality, organically grown vegetables, then Wadi food is highly recommended. Ezbet Makar: This family-owned farm has been operating out of the Sakarra area for the past 130 years, applying European agricultural science to Egyptian soil. This combination gives us the benefit of having fresh locally grown herbs not normally available in Egypt. Their highly informative website translates all their product names to both French and Arabic. You can order online via a contact form sent to a customer service representative, who then contacts you by email with the price of your order. This is a great option for those specialty vegetables (sorrel and mustard leaves!) not available at other outlets.